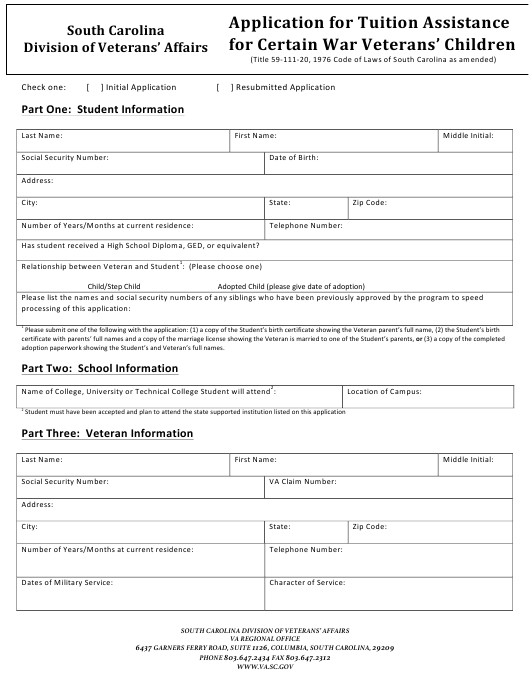 This South Carolina-specific "Application for Tuition Assistance for Certain War Veterans' Children" is a document released by the South Carolina Department of Administration. Download the fillable PDF by clicking the link below and use it according to the applicable legal guidelines. Has	s tudent	r eceived	a H igh	S chool	D iploma,	G ED,	o r	e quivalent? adoption	p aperwork	s howing	t he	S tudent’s	a nd	V eteran’s	f ull	n ames. Is	t he	V eteran	M issing	i n	A ction? the	U .S. D epartment	o f	V eterans	A ffairs? Did	t he	V eteran	d ie	d uring	m ilitary	s ervice? Compensation/death	b enefits)	b een	g ranted? Was	h e/she	r ated	p ermanently	a nd	t otally	d isabled	b y	t he	U . S .	D epartment	o f	V eterans	A ffairs	o n	t he	d ate	o f	d eath? The	e ffective	d ate	o f	t his	b enefit	i s	t he	d ate	o f	r eceipt	o f	t he	a pplication. WHEN	M AKING	A T RANSFER	L ETTER	R EQUEST. to	b e	r equested	f or	e ach	n ew	s tate	s upported	s chool	t hat	a n	a pproved	s tudent	w ill	a ttend. Transfer	l etters	c an	b e	r equested	b y	c alling	o ur	o ffice	a t	8 03-­‐647-­‐2434. receipt	o f	t he	F ree	T uition	A pplication. qualify	m ay	r eceive	t hese	b enefits. application	a nd	s till	b e	a c urrent	r esident	o f	S outh	C arolina. institution	l isted	o n	t he	a pplication. or	y ounger,	a nd	i s	p ursuing	a ny	t ype	o f	u ndergraduate	d egree. Basis	o f	A ward	– P roof	o f	q ualifications	f or	t he	b enefits. Purple	H eart	o r	M edal	o f	H onor. cannot	b e	a ccepted.